Sci-fi films took the top three spots in box office sales at that movies this weekend. The Hunger Games: Mockingjay, Part 1 in first, Big Hero 6 in second, and Interstellar in third. Mockingjay, Part 1 also takes the title of best opening weekend for 2014. Transformers: Age of Extinction previously had that distinction. So what do you think of the current box office king. 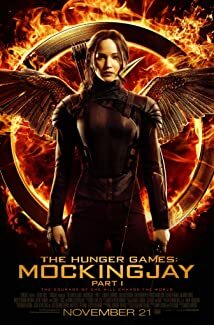 Did the third Hunger Games improve upon the gains made by the second film? Mockingjay was good, though it diverged from the book in places. I suspect some of that was to deal with not just the transition to the screen but also due to the decision to split the book into two movies and account for the passing of Philip Seymour Hoffman. And if you haven’t seen it yet, don’t bother staying until after the credits. Haven’t seen Interstellar but from what I hear (or can’t hear, har) I won’t regret waiting to see it until it’s on disc and I can (a) pause the movie for bathroom breaks, (b) have captions to hear what they’re actually saying over the SFX. Good to see Big Hero Six still doing well, though. My son and I loved it. Now that has an after-credits scene that is well worth the extraordinarily long credits to see.